This charming 3 bedroom Kamares property is a detached home situated in a quiet and picturesque hillside setting in an exclusive award winning resort. Nearby is the popular Kamares Clubhouse with restaurant facilities, swimming pool, tennis courts and adjacent Medical Centre. 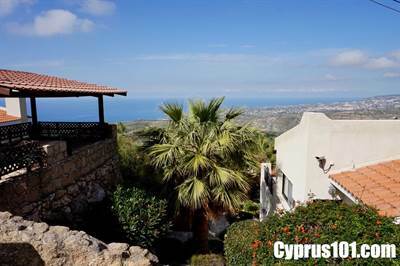 Paphos Town and the International School of Paphos are a 10 minute drive away. The property benefits from spectacular panoramic sea and mountain views and has secluded and very private cottage style gardens with a large variety of colourful trees and shrubs – simply a gardener’s paradise. Sliding patio doors from the dining area provide easy access to a spacious sun terrace with magnificent unobstructed sea and mountain views – a perfect place to have a glass of wine and enjoy the beautiful sunsets.